Has Miley Cyrus died as news reports bath tub death of singer. Miley Cyrus dead?The internet and news mediums have gone crazy after reports of the death of singer Miley Cyrus.The controversial singer was reportedly found dead in a bath tub. But thankfully ,it turned out that the Miley Cyrus dead story was nothing but one big hoax.It really baffles me who starts all these terrible stories.Don't they ever wonder what damage it might do to the family and friends of the victims?Because that is what they are,VICTIMS. How can you just wake up and decide to spread false stories about the death of someone?I just don't understand it. of the hoaxes have used CNN logo to make the story look real. This is not the first time the 23-year-old singer has been subjected to false death rumors. According to Snopes, the false story claims that Miley Cyrus died of a prescription overdose. 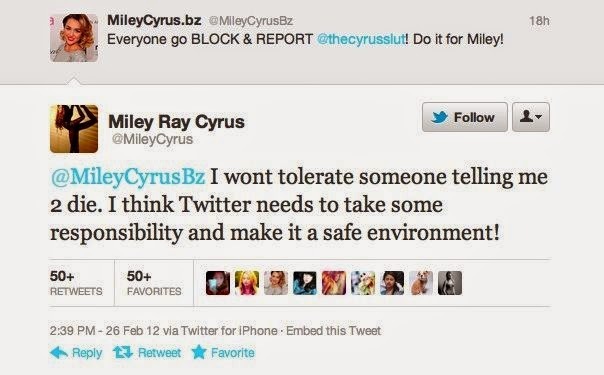 Miley has not responded directly to the rumors but has remained active on social media. 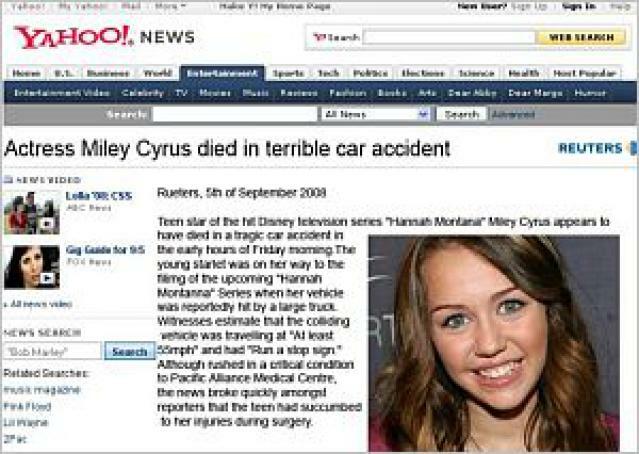 The terrible news however sent fans of the singer into a frenzy with searches such has is Miley Cyrus dead and has Miley Cyrus died on the net. Miley Cyrus is alive and well. She is currently dating Liam Hemsworth and is rumored to be pregnant with her first child and possible having a secret marriage. Miley Cyrus released her most recent album Miley Cyrus & Her Dead Petz in 2015. The music was released independently, and many fans are wondering whether she is releasing new music in 2016. Before the death rumors, most speculation about the “23” singer is about her relationship with Liam Hemsworth who is a star of The Hunger Games movies. Many celebrities have been subjected to death rumors. Some of the trending searches for Miley Cyrus include CNN and Fox in an attempt to lure unsuspecting Facebook users into believing the story is true. The story also appears as “breaking news” on the image shown on Facebook. Users give the app permission to post on their page, and they then share the false information with their friends without knowing. Many fans were revealed to find out that Miley Cyrus is alive and well. Media speculated that Miley was having a break down around 2013 when she released her album Bangerz. The singer went viral for her twerking and in a recent interview with Elle UK magazine she spoke about dancing on a teddy bear. Miley Cyrus is currently working on her next album. She is also keeping busy by using her talents as a key advisor on the tenth season of the singing competition and TV show The Voice. I think not until someone is seriously sued or jailed will these nasty rumours stop.It has to be realised that celebrities are human too and a limit should be set for the kind of nonsense that is allowed. Meanwhile we are all glad that Miley is not dead but well and alive.